Another fantastic sound mangler from Audio Damage that won't hurt your wallet. Granular algorithm for special effects. Authentic '80s-style Pitching. Dancing GUI eye-candy. More panning options would be nice. 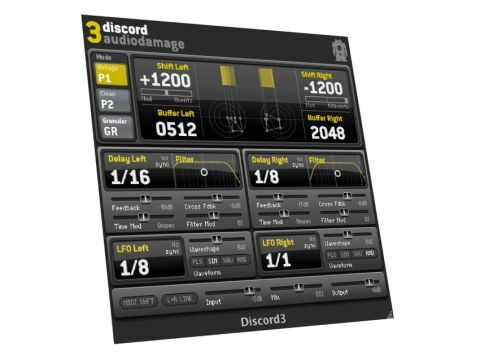 Like most plug-ins from the Audio Damage lab, Discord is designed for creative experimentation and is well capable of mangling a sound way beyond recognition. Version three updates the original concept with new pitch-shifting modes, a variable band-pass filter and a brand new animated GUI. The GUI update is not just a cosmetic improvement, it's made programming easier and more accurate than previous versions by implementing a 'grab the number and scroll' technique. This is especially helpful for making accurate adjustments to the amount of pitch shift or when setting the delay time in ms.
At the heart of the machine is a true stereo pitch-shifter with three distinct algorithms; kind of like the past, present and future of pitch-shifters. The P1 'Vintage' is modelled on the Eventide H910 and H949, while P2 'Clean' represents the modern sound and the third is Granular - which opens the way to another world of textures entirely. Next in line is a pair of delays, one each for the left and right channels. Each side has its own independent set of controls for delay time, feedback and cross feedback. The delay time ranges from zero to two seconds and can also be programmed in sync mode offering speeds between 1/1 and 1/32 with triplets and dotted notes. The clever bit happens when the delay line feeds back into the pitch shifter. This makes each repeat shift up or down by the same amount again, sending the pitch spiralling up or down. This can spin right out of control with high shift and feedback settings, and create some awesome splattering and grainy tones. The third effect block in the chain is a band-pass filter with controls for cutoff and resonance/width. This helps shape the sound to fit in the mix and the cutoff can be modulated via the dedicated LFO. As multi-effect units go, Discord has a unique sound largely owing to its characterful pitch algorithms that alter the basic tone in interesting ways. The delay and filter sections are really useable and work really well when feeding back into the pitch section. This makes it great for simple things like subtle double tracking for vocals through to wide wobbly chorusing. With longer delay times it's easy to dial up cool underwater Dub-tek echoes, and weird granular twists that can be animated and take on a life of their own through the LFO. The pitch shifting is not scale based, chances are after the initial delay repeat harmonic material will start to take on a more discordant nature - think along the lines of cinematic eeriness and Stockhausen clangs and you'll be in the ballpark. One thing we would like to see is more panning options, besides the straight stereo spread. It would be nice to be able to pan the channels using the LFO, though we're told there will be some improvements to this in the next update. If you already own Discord 1 or 2, this is a must have update which expands the palate and makes programming slicker and quicker all for $10. At the regular $60 asking price, it's still good value, and is highly recommended for everyone looking for a unique sound mangling tool for their creative arsenal.